So much for getting back into a normal schedule, haha. I think I spoke too soon last week when I thought I was ready to jump back into my normal posting schedule. I haven't been feeling too well since Monday, so I've been taking some time to rest. Anyway, moving right along to the topic of today's discussion, wearing distressed jeans in the winter! I love distressed jeans, particularly the ones I'm wearing here, they're definitely one of my most worn pair and the style that has the most distressing (is that even a word?) in my denim collection. 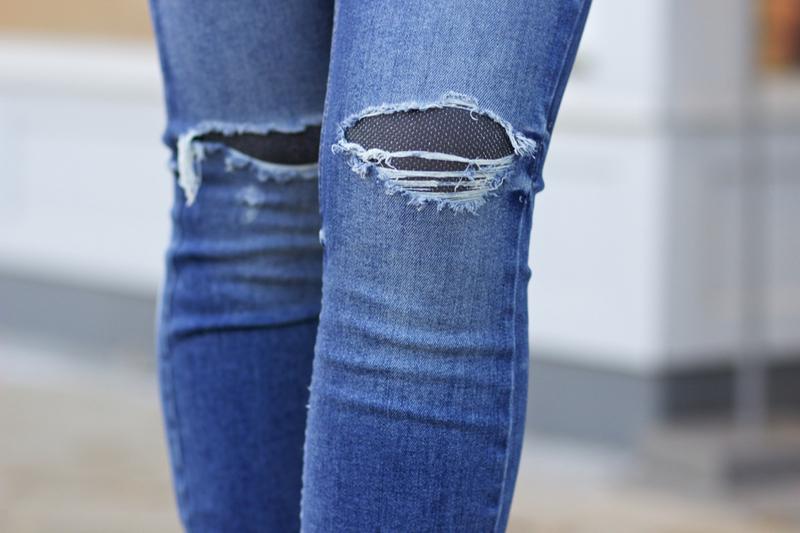 I know this style, distressed knees, is quite popular and the thought of not being able to wear them can come to mind as the temps continue to plummet. I'm here to showcase how they can be worn all winter long and with the number one technique we all use come fall and winter and that, my friends, is layering! Since we're in the festive holiday season, I opted for grey sparkly tights under my jeans to have them show through the wholes, which is a fun option or you can opt for a patterned and/or colorful pair to add a subtle or not so subtle statement to your winter look, while keeping extra warm; it's as easy as that! Now, I will say this, depending on how tight your jeans are and the stretch they have, it can be a bit hard to do this, so thinner tights may work better and more comfortably than those thicker lined options, so that you can at least sit and bend your knees without cutting off any circulation! I hope this gave you an idea for extending the wear of your favorite pair of distressed jeans this winter. This is something that's not only reserved for skinny jeans, it would look super cute with either distressed boyfriend or girlfriend jeans, too! I encourage you to get creative, add some plaid, sparkle, or color! This would be a great way to add a dose of color to a predominately neutral winter color palette! Thanks so much for stopping by, my dear friends, and I hope you have the most amazing day!